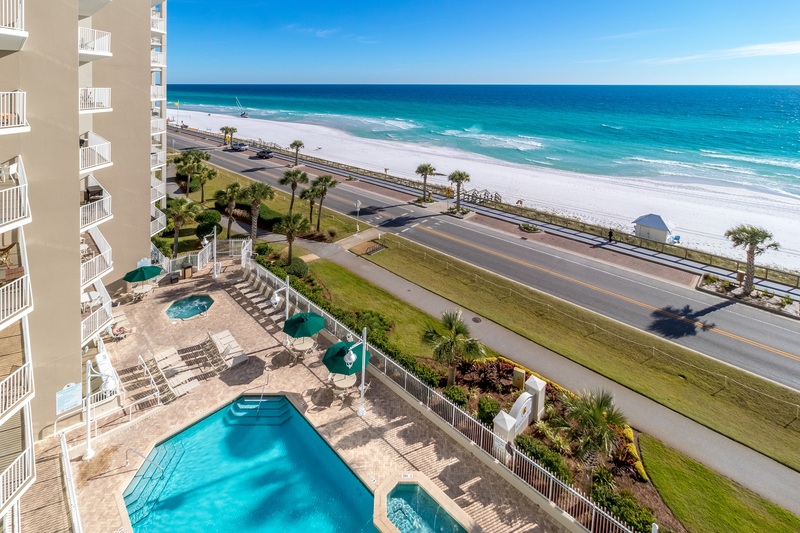 This beautiful Gulf view newly renovated Majestic Sun 413A condo at Seascape Resort is located directly across from the beach on the fourth floor and sleeps a total of eight. This condo offers amazing Gulf views from all common areas. Wake up and enjoy your morning coffee while taking in the beautiful sights of summer from your private balcony. 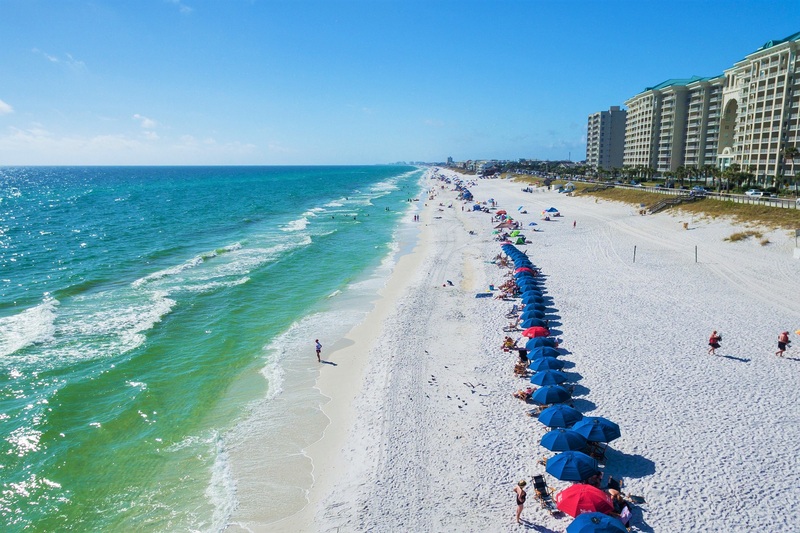 With the rental, you are provided with two beach chairs and an umbrella in your condo that you can take to the beach, in lieu of spending $40 a day using the local beach service operator. For added convenience, our office is onsite, on the ground floor of the B building in Majestic Sun should you need anything. Upon entering this two bedroom, two bath condo, you will find a comfortable living area where you can admire the beauty of the Gulf or watch TV from the HDTV. The living room also offers a queen sleeper sofa. The kitchen is equipped with stainless steel appliances you would need for a home cooked meal. The dining area and breakfast bar can seat up to eight. 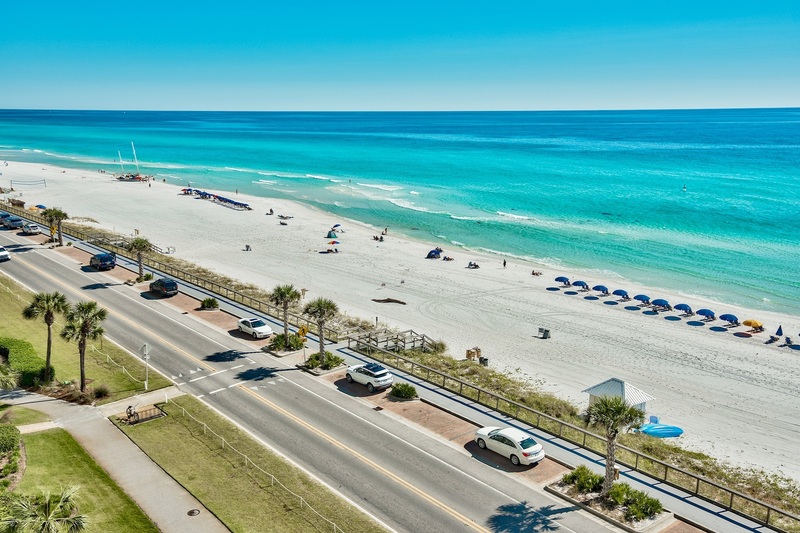 Enjoy your meals at the dining table with beautiful views that the Emerald Coast has to offer. The Gulf view master king suite offers an HD TV, stunning views of the beach with access to the private balcony and its own private bath. The second bedroom is a bunk room with a twin over full bunk with a trundle bed, HD TV and attached bath. A washer and dryer can be found in the unit at your convenience. "WE WERE VEREY FORTUNATE TO HAVE FOUND THIS LOCATION WITH A BIG PART OF THAT BEING THE EXPERTISE AND ASSISTANCE OF JAMIE AND BRITTANY WHEN BOOKING. A BIG THANKS TO BOTH. " "Tom, thank you so much for feedback! 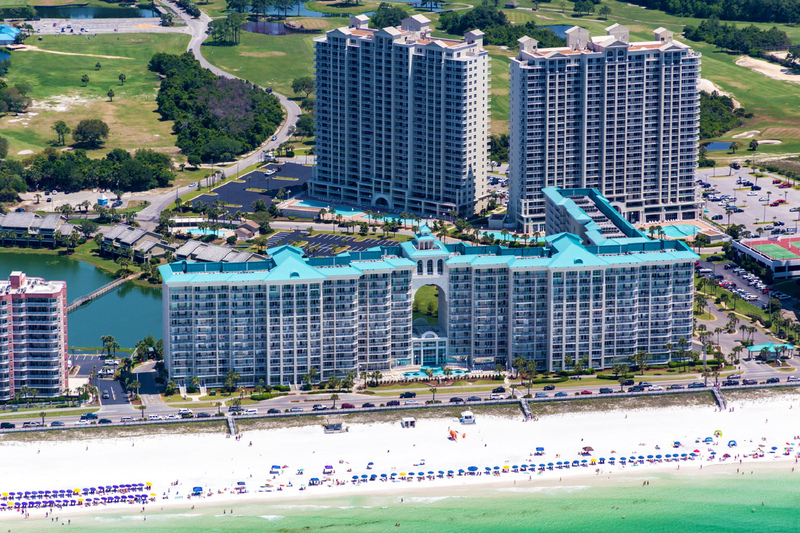 Here at Destin Palms Vacations we strive to help our guests experience the very best of the Emerald Coast. We look forward to welcoming you back to Majestic Sun again next year! See you at the beach! Destin Palms Management"
"We are happy you enjoyed your relaxing stay with us. Hope to see you again soon. 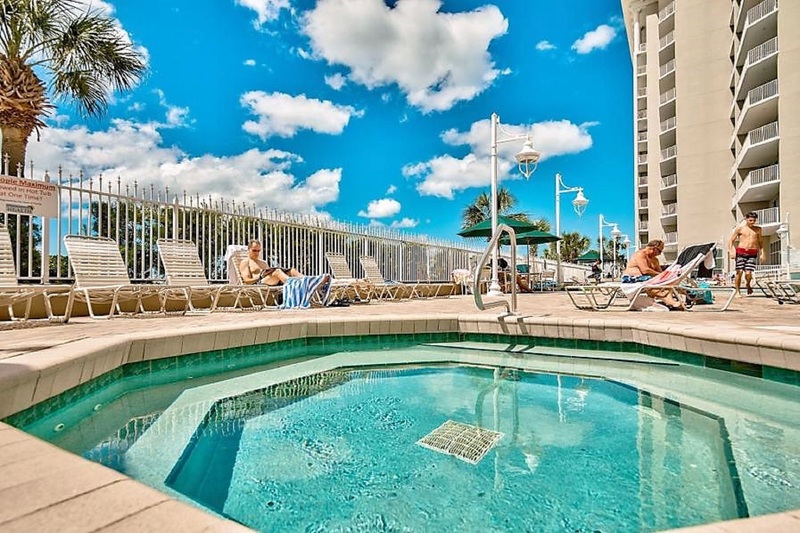 Destin Palms Management"
"We had a great experience at Majestic Sun. The condo was really spacious and nice. We are a family of six and slept comfortably in a two bedroom condo. We only had a couple of issues. We were told it would be ready by 4pm, but it was not cleaned yet. Also, each guest gets a rubber bracelet to wear. One fell off my daughter in the beach and we were charged $10 for it (it probably cost $.30 to make). Other than that, you cannot beat the beach and we thoroughly enjoyed our stay. We will be back!" "Thank you for your feedback! Check in time does begin at 4pm. NOt very often does a guest have to wait until after 4pm, but sometimes things beyond our control can happen. in the rental agreement, mobile app and in the unit, we do make all guests aware that the bracelets will be a $10 charge if lost. We have to purchase them from the HOA, so a guest is responsible for replacement. The reason for the wristbands is to keep the resort exclusive to paying guests. We are glad that you enjoyed your stay and hope to see you back in the future :) - Destin Palms Vacations"
"Great condo! Very clean! Love the style and floor plan!" "Your comments and feedback are greatly appreciated. We will pass them to our staff. Hope to see uou again in the near future. Destin Palms Vacation Management"
"Everything was perfect as far as the property, layout, location. The management was on top of every little detail and quick to respond to any question. The location was surrounded by restaurants and any attraction you would hope for. Spring break! If you are good with going to Coney Island, this is it during spring break. Absolutely too many people and under age guest who drank irresponsibly. Would I come back to this location? Absolutely but not during spring break. " "Thank you for your feedback. We will pass along your comments to our staff. Hope to see you in the summer or fall. Destin Palms Management "
"Property description was accurate. 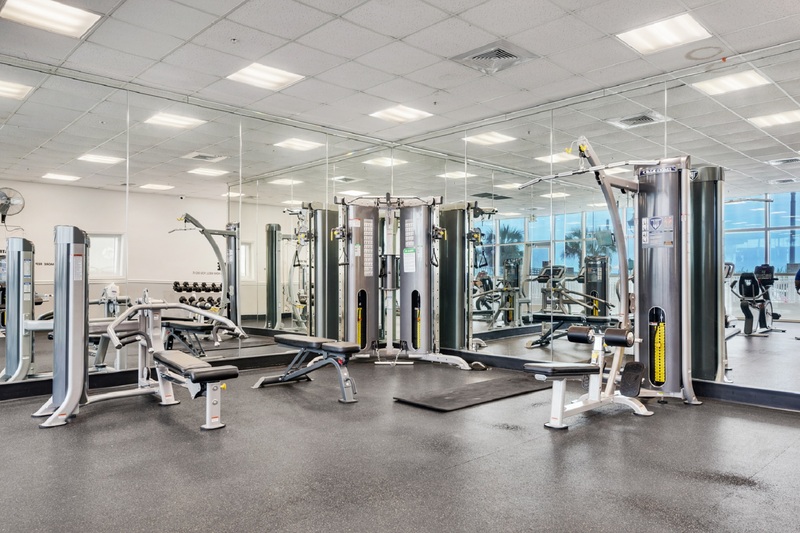 Location was very convenient to get to everything this area has to offer. Sugar sand beaches are beautiful and great to walk on. " "Weather was horrible, but condo was perfection! We will be back, hopefully with better weather so we can actually use the beach and outdoor pool. Only minor things that were a bit dirty..some silverware, comforter, etc. But overall nice and clean, and the view was beyond amazing!" "This condo is completely updated in serene beach decor. It is modern and very clean. The view from your living room and master bathroom is of the beautiful water. Sunrise can be seen on the left and the gorgeous sunsets on the right side of your balcony. We used the washer and dryer the whole trip and appreciated if being available. The kids splashed around in the indoor pool each day while the adults enjoyed the 2 hot tubs. We spent many days on the beach, who is just a short walk across the street. We appreciated the 2 beach chairs that we were able to use during our stay. I used the gym a few times, as well. We met many owners who were staying for the holiday and they were just lovely people. We have to take a moment to recognize the friendliness and professionalism of the Destin Palms management company staff: they went above and beyond what is expected and we truly appreciated the kindness extended to our family. 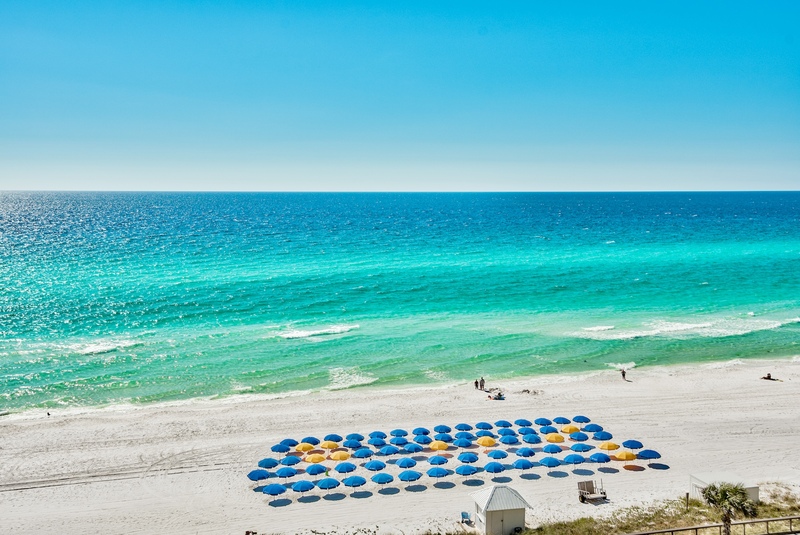 If you want a peaceful and relaxing stay for your family in Destin, you've found your place. " "This condo was awesome just like the pics. Everything wa on point. The view was perfect. Can't wait to book again." "This was a really great place to stay. I would recommend for people coming in for beach. Absolutely close access to beach, great indoor outdoor swimming pool. it was beautifully equipped for luxurious stay with full kitchen and laundry and 2 baths. It was clean and in close proximity to all shopping and grocery possible. Other tenants and renters were friendly. They provided carts to carry luggage as well smaller carts for grocery." 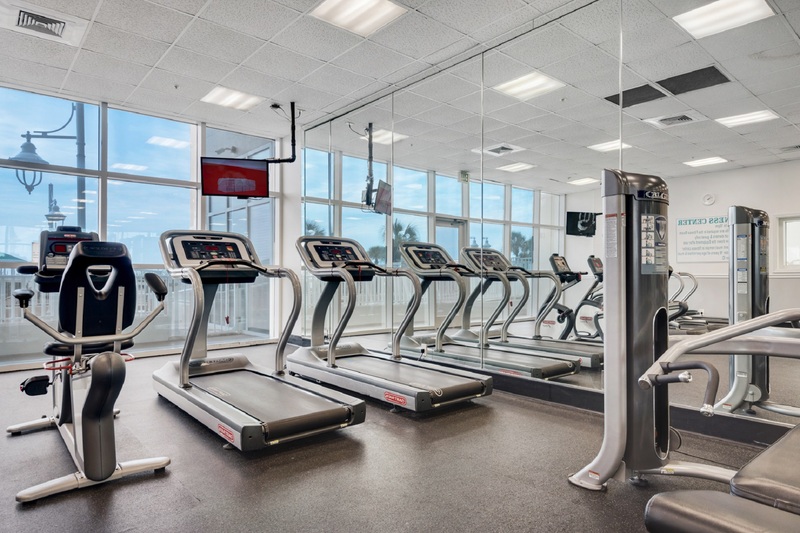 "The condo was clean, comfortable and was in a great location. We came during spring break and there were definitely a lot of college kids. We were able to stay away from the really big crowds fairly easily. Hotel security was really good about making sure only condo guests were using the pool and hot tub. " "We are so glad that you enjoyed your stay! This property is amazing and the views of the gulf are incredible. We hope that you join us again in the future! ~ Destin Palms Management"
"Thank you for your feedback! We are very glad that you enjoyed the location. Majestic Sun is a great complex, with AMAZING views. We hope that you come to visit us again in the future. 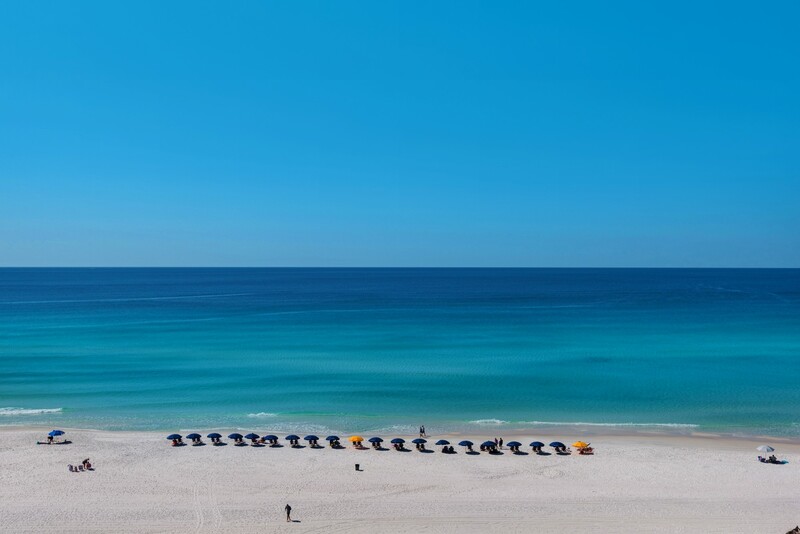 ~ Destin Palms Vacations"
"I had a wonderful time! This condo was beautiful and very clean. Great location. We just got back and plan on coming back in a few months and we want to stay at the same condo. " "Thank you for your review. We are so glad you enjoyed this beautiful condo. Please contact us to book your next vacation as soon as you know your dates. -Destin Palms Vacations"
"Beautifully decorated. Love the large deck! The master suite was especially nice and having the deck off the master was a bonus. We had everything we needed in this unit. This will be our 1st choice when we come to Destin. Highly recommend!!" "Thank you! 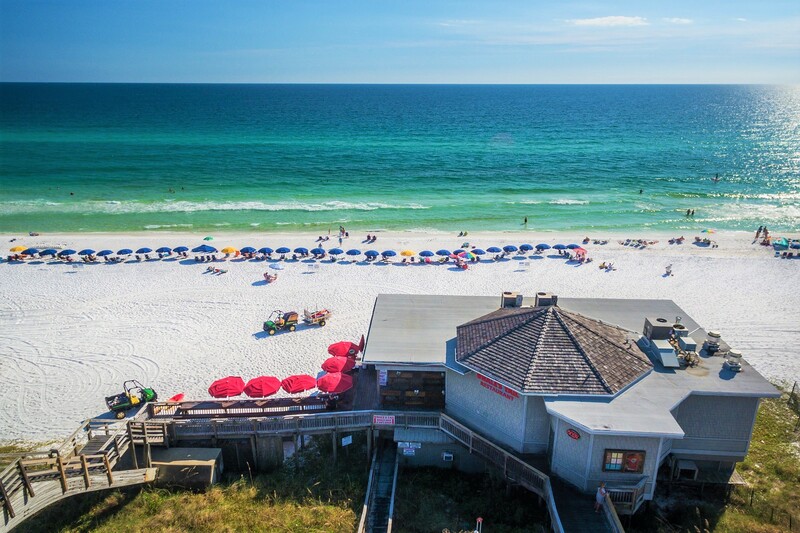 We hope you come back to Destin and visit us again!" 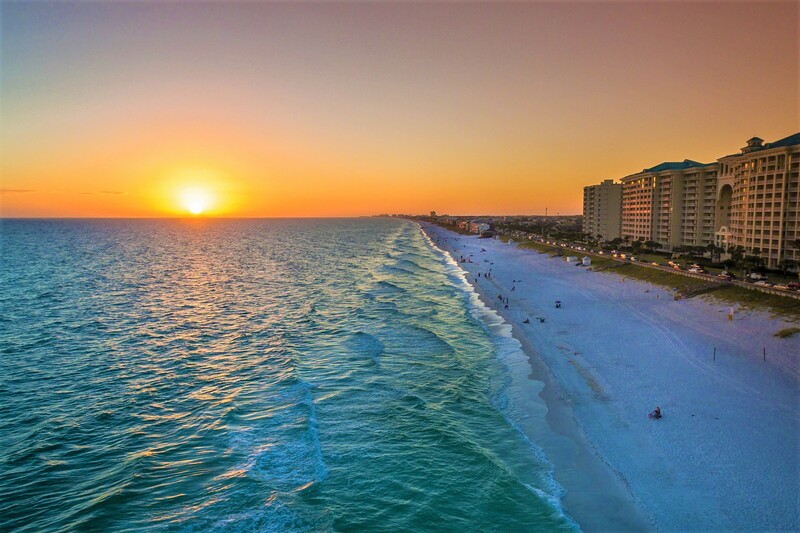 "We had an amazing stay in Destin! This was our 4th stay at the Majestic Sun and this was our favorite unit so far! The renovation was perfect. Very open and not too cluttered. The beds were very comfortable and perfect for our family of four! All the comforts of home were there and the kitchen was fully stocked. We will definitely stay in this unit again!" "Thank you for your kind words. Everything in this unit is brand new, and we are glad that you enjoyed it so much. Please feel free to contact Destin Palms again, and we will look forward to your return. Enjoy the rest of your summer!" "This condo has been newly remodeled and it has that perfect cottage/beach feel! We loved the larger kitchen space and new granite counters. The wood planks that cover the master bedroom wall, kitchen backsplash and under the bar are SO cute. Two nice beach chairs and an umbrella were provided and we used those every day. My sister's family was in a smaller size condo and there was a big difference in the size of theirs vs. ours. We ended up eating all our meals and hanging out in our condo together the entire trip because we had more room! We really loved the longer balcony and access to the balcony from both the living room and master bedroom. Master bedroom has a large walk-in closet and large bathroom also. We also appreciated were the parking garage, parking in the shade makes a huge difference when it's so hot outside. The complex is very nicely landscaped and well kept. The management company was also very easy to work with, quick to respond and friendly. I would recommend this condo to friends and would definitely stay here again. " "Thank you for such a great review. It is a gorgeous condo! We hope to see you in the near future! - Destin Palms Management Team "
"Beautiful condo! Loved the decor and the welcome message on the chalkboard from the staff. They were great to work with. We'd definitely stay here again!" "We are so ecstatic that you enjoyed your vacation with us! We can't wait to see you in the future for your dream beach vacation! Sincerely, Destin Palms Management Team "
"For years we traveled with our two small children to Myrtle Beach..yes we still enjoy the Altantic side and MB as we've had amazing times there however, we were absolutely amazed with the Water, Beaches, our fantastic Room! 413A was just remodeled and the upgrades were on point with some of the best places we've stayed. The Gluf View, access to pool, beach, restaurants, etc were simple and easy to navigate with a 4 and 5 year old who have been begging to go back! " "You will not go wrong on this one! This was our first stay in the area. Everything was in tiptop shape. I was amazed at the care taken with the grounds and unit. I love the code entry, no keys to lose or track down the person that has them. I appreciate the short stay option. We only had a few days that would work for us. We felt totally safe. This was a girl trip. If you're looking for a do nothing trip its here. If you can walk a little you would never have to start your car. If you're looking for a blast busy all the time it's here also. I hope to be back soon!" "We always stay at Majestic sun And we love it. This condo was the best by far. The renovation they did was amazing. The decor and everything is perfect. We did have a problem with the air conditioning not working the first day. We called and they fixed it right away. Love the company we rented through. The view at Majestic Sun is the best. Would definitely stay again and recommend." "Thank you so much for your wonderful review. We had a lot of fun putting some of the design elements into this condo and it is great to hear the positive feedback. We would love to have you (and your family/friends) as guests in the future. -Destin Palms Vacations Mgt"